A538 All Purpose Cleaner is a time-saving, concentrated, water-based cleaner for metal parts, engines, machinery, and more. This powerful, high pH concentrate removes grease, oily dirt, grime, and industrial soils. Formulated for use by serious cleaning professionals, this powerful, high pH cleaner quickly cuts through grease, oil, dirt, stains, and other tough grime within seconds after application. 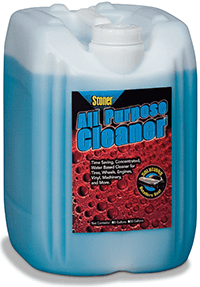 Stoner All Purpose Cleaner has dozens of uses as a fast stripping cleaner for tires, rubber, whitewalls, wheels, engines, grills, plastic, vinyl, and more. This powerful concentrate must be diluted with water before use. Have you used All Purpose Cleaner?